Picture yourself 20 years from now. What do you see? Perhaps you see yourself traveling the world, enjoying new cultures and meeting exotic people. Maybe you see yourself sitting in the comfort of your own (paid for) home making memories with your family. You might even picture yourself as a successful owner of your dream business. All of the above options are absolutely attainable. The road to reaching these dreams is living modestly now. It’s a completely natural feeling to want things and want them now. After all we are human beings. The key to getting the things you want is sacrifice. Live modestly now, live it up later. Imagine the amount of money you would be able to save with a few sacrifices. Living in lower cost housing could free up several hundred dollars a month. 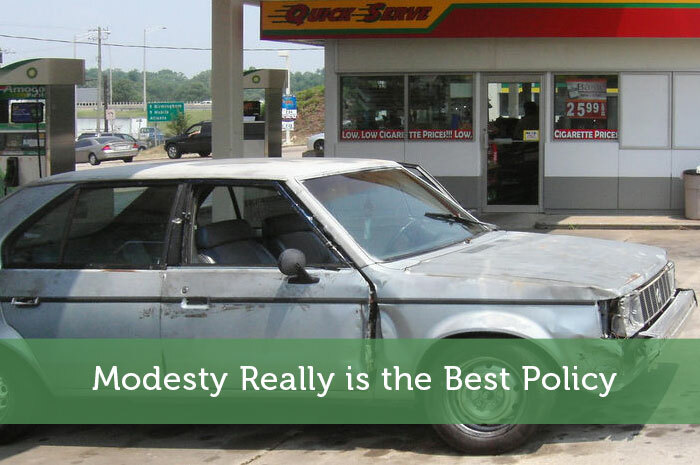 Opting for a used car that you can afford to pay cash for will save you thousands. Skimping on the new clothing and latest gadget purchases can save you a substantial amount every year. I have found that one of the biggest hurdles to jump when starting to cut back financially is worrying what others think of you. At times it can be tough to live modestly when it feels as if everyone around you is living it up – buying the latest and greatest of everything. The occasional thought of what everyone else is doing and how they are living will come up – it’s virtually inevitable. As long as you can keep the picture of financial security and your chance to later live it up (responsibly) in mind you will be able to keep your focus. When you have become modest with your money and started saving for the future, financial security will be your ultimate reward. With a little bit of investing and planning you will be able to watch your money grow and will be able to afford the things you once dreamed of. In the end you will be happy with every sacrifice that you made. Author Bio: Alexa is a newly single mother to two little girls. She chronicles her journey as a single mother trying to make it big at Single Moms Income. I could not agree more. Pinching every penny will only take you so far. It’s about looking for those bigger savings and a mentality of thinking past tomorrow in order to be successful. Pinching pennies certainly helps but its those big savings that really add up! Worrying about what others think about you and/or trying to keep up with others will hurt your wallet, modest is always best. Something that I need to think of all the time! Sometimes I don’t even think we notice the fact that we are trying to keep up with everyone else. You have to take a step back and really examine your choices and align them with your own priorities. I am sure we all have our struggles with that! I’ve been living with a modest mindset for the last few years in fact this year my wife and I even decide to scale back on our vacation and just do a little weekend getaway instead. I know that is not what I really want to do but in the end it will be well worth it. It’ll be worth it in the end! All of the sacrifices you made will turn into something great! That makes too much sense man. It would be great to see. I can tell you for a fact that’s what has helped me since the 2009 real estate crash – that the country has not recovered from. Spend less save more have fun. Good motto! Spend less Save more Have fun! Good post. It is important to live modestly at really any age. It can be easy to blow through money. I have never really cared about what other people thought about me or my money. As long as I enjoy my life and take care of myself and my family, then that is all that matters. Your family is lucky to have you. With such a great attitude I am sure you are doing pretty well for yourself! Yeah, it’s hard when people get on your case when you’re tyring to be thrifty. My family mocks me sometimes when I’ll use building materials I got off craigs list to build our family deck or something. My wife and girls think it’s great and it’s all good, but my family thinks that everything should be bought new, etc. It’s ridiculous and wasteful, and I never like when they get on my case. BUt I guess that’s the stuff you gotta deal with when you try to live right! I think thats great you get your building materials off of Craigslist. Home Improvement at a great price? Sounds good to me! Hey Alexa – very true! We saved a lot to pay off our first mortgage early and it was the best decision we ever made. Much happier to have done that then spend all my money on junk! No doubt! I bet that’s a great feeling. I like how you use the word “modest”. I think cutting expenses gets a bad reputation in a consumption focused world. We think in all-or-nothing terms, so it’s either get the new iPad or carve your messages on a stone tablet. Modest is a good way to live life. Make some sacrifices for the future, but don’t stop enjoying your present either. Definitely! You just have to be realistic with your money. You know what you can and can’t afford so as long as you stick to that you won’t stress out about being broke all the time. True! The sense of peace, when you know your money is in order, is something almost priceless! Great post. That is one of the hardest things we have had to deal with in our guest for financial independence is my family’s perception of us. We used to spend like no tomorrow and I think my family equated this with success, even though we were up to our eyeballs in debt. Now we have stopped spending on things that we don’t value, and my parents think we are miserable and destitute, which is funny because we are so much happier now. You have to live your own life and not worry what others think. It can definitely get hard sometimes, trying not to care about what others thinks. But as long as you and your family are happy thats all that matters! Yeah, it’s hard to do, especially with social media sites like Facebook rubbing that stuff in your face. But you never know what is going on behind closed doors. One of my favorite sayings is, “keep your side of the street clean.” Just focus on yourself and what you need in life. Oh yeah everyone’s gotta do Facebook updates when they get something or do something awesome. But if you can try to be happy for them (hard to do i know!) it will make it easier on you. We could probably afford our new rent on our own, but getting two roommates means we have over $7000 more this year to pay off debt. If you don’t mind the roommates and they give you some extra breathing room, sounds like the way to go! This is why I like knowing how much you have to save. While I’m a fan of living modestly when I have to, if I don’t have to, why not spend it today and enjoy yourself? Life is about balance. If you can’t afford to spend money today, you definitely need to cut back…. For sure! If you are in a situation where you don’t have to be modest with your money then more power to you, enjoy it! I think it’s good to balance leading a modest life with spending a bit more on things you really love. If you focus too much on modestly you don’t get to enjoy the fruits of your labor. Nice post Alexa, being cheap doesn’t work on the long term but being frugal surely does. True…being cheap could just make you and the people around you miserable. Being frugal allows you to save money without it affecting others significantly. Good for you Alexa. I don’t know how old you are, but with 2 little girls and becoming a newly single mom, I applaud you for having the mentality you write about! I live this life every day and my family and I couldn’t be any happier! That’s awesome that you and your family live by this lifestyle Lou. I think a big part is taking that approach from the start with kids. If you spoil them early and then cut back they’ll have a lot tougher time understanding it. They might not be as happy if they get a waste of the materialistic life. Living modestly also includes living within your means and not assuming you are entitled to everything. For example, the new Ipride (credit to theoatmeal.com) came out and you feel you must have one! This often happens at the expensive of savings, future plans and another charge to a credit card. For me, living modestly is in finding pleasure in hobby’s that are affordable and reusing things that I already have. A couple of my hobby’s include reading, aquarium fish and volunteering at the local state parks. All of these are done next to nothing each month. I completely agree. I’m glad I got over the need to have the latest and greatest gadgets or whatever else. Instead I’m content with what I already have. Inexpensive hobbies are important too. I’ve been getting more into hiking which is a great inexpensive hobby. Not only is it cheap but it’s also good exercise and there’s bound to be some awesome views. Great post. I agree that modest living is part of the solution to financial security and it doesn’t have to be about pinching every single penny. Changing my luxury habits (Starbucks coffee, second car) were though at the beginning but after a week or two, my new modest habits became the new normal. Modest future living should also be recognized. People tend to sacrifice a lot in the present in order to reach a dreamy future filled with travels and fun activities. The reality for most of these dreamers is that future passive income won’t be as great as you think. I’ve done well to save for my future but realize how easy it is to spend all my income. Good point about future living. A lot of people do have intentions of living lavishly later in life and use that as motivation to live modestly today. That isn’t very practical thinking considering we don’t know how long we’ll live. By developing modest habits early we can at least carry those habits forward and prevent wasting money on unnecessary things like starbucks. So true Alexa. The truth is that you can still afford a small luxury from time to time when you live within your means. Just not the big ones that put you in debt or knock away savings. I enjoy those little luxuries so much more when I have worked hard and lived modestly so I can afford them. Even dumb things like a cup of coffee from Starbucks with is a special treat these days. Yep, it’s the big luxuries that can be especially detrimental to your finances. A luxury that becomes a regular habit can also be considered a big luxury when you add up the costs though. So you have to consider how often you really need those little things. Sure it’s easy to think of it as small each time to buy it, but over time it could cost even more than those big purchases that you’d love to make.